Important Gauges Every Evo X Needs to Have! Let Modern Automotive Performance help you give your Mitsubishi Lancer Evolution a major boost in power for your daily drive or your next race. We’ve never seen a racing community latch onto a vehicle like it has the Evo. It’s a favorite among racing enthusiasts for its surprising power and handling. Gearheads like us quickly dived under the hood to find places where we could add even more power and discovered that this sport sedan offered a tremendous amount of customization. Since 2006, Modern Automotive Performance has worked on these fantastic cars, learning their ins and outs. We’ve tested countless Evo parts for high performance, and when we can’t find a part that meets our ridiculously high standards, we’ve made our own. That’s why we’re proud to work with some of the best product manufacturers in the business, such as GReddy, HKS, Perrin Performance, Tomei and more. Improve engine performance with new exhaust or intake systems. Offer different loadouts of exhaust pipes for strong performance on tracks or strips. Upgrade engine internals for more power. 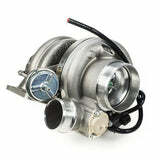 Add a turbocharger for a huge boost of power on demand. Equip your dash with gauges and engine control systems that let you monitor important systems. Add handling or stopping power with improved transmission or braking systems. Those areas just scratch the surface of what we can do for you. Our low prices, outstanding shipping rates and Loyalty Rewards program help ensure you can do even more with your hard-earned money. And our staff of experts is ready to answer your most detailed, nitpicky questions so you have a successful installation. It’s all part of our pit crew mentality: We are in your corner, ready to help you make your Evo dreams come true.